TV Shows now available in Australian iTunes store!! 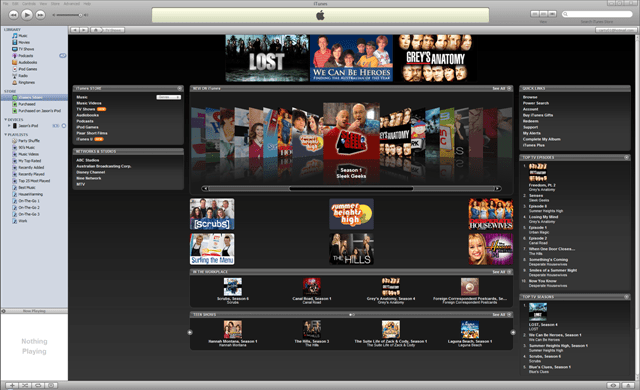 Out of nowhere, with no announcement from Apple, TV shows have just shown up in the Australian iTunes Store. TV shows including Lost, Greys Anatomy, South Park, Desperate Housewives and many more are available now! You can buy a whole season of Lost for $41.86 (this varies between shows up to $71.76 for the first season, 24 episodes of Scrubs). A single episode costs $2.99. I’m pretty comfortable with that pricing given the convenience that iTunes offers over going to the store to buy or rent the DVD. Although it’s great to see some local shows, studio partnership is very limited at the moment, with only ABC Studios, Australian Broadcasting Corp, Disney Channel, Nine Network and MTV on board. If TV Shows on iTunes in Australia is going to be a success, Apple needs to get to work on expanding this initial offering quickly. Although this is a welcome addition to iTunes, we’re still lacking the movies available in the US. I’ve just downloaded the final episode from Season 4 of Lost to check out the quality. That episode is 463.7 Mb and is estimated took around 15 minutes on an 8Mb connection. The quality certainly isn’t HD, but looks pretty good even when displayed full screen on a 24” monitor, but I’d stop short of saying it’s great. The 640×360 video is probably on-par with DVD-quality resolution. Details of the file are listed below. These movies are made to be watched back on the gorgeous 3.5” screen of an iPod Touch or iPhone, they look sensational. So overall, will I download TV shows from iTunes rather than watch them in 1080i on my HDTV, probably not. Then again if I miss an episode and really want to see it.. then yeah I probably will.